The Circus as John Wood intended. It’s my favourite punchline as l go around on my ‘training day’ with a party of curious tourists in my power! I am in the process of being coached to hopefully become a member of the Mayor of Bath’s Corps of Honorary Guides. A group of knowledgeable men and women who give their time freely and conduct two-hour tours of the tourist ‘hot-spots’ around Bath. There is no charge – and that’s one of the reasons these guides get such a good Trip Advisor rating – but they are also friendly, generous with their time and do know what they are talking about. It’s what l have done, l suppose, all my professional life and that’s provide information in an entertaining way. Which gets us back to not being able to see the ‘Wood” for the trees. It’s a line you can use when you get to Queen Square or save it for even greater effect in the Circus. It refers of course to the fact that five rather large trees are now blocking out most of the Georgian architecture for two-thirds of the year. You have to wait for winter to glimpse more of the architectural work of John Wood – father and son – through the bare and tangled branches. 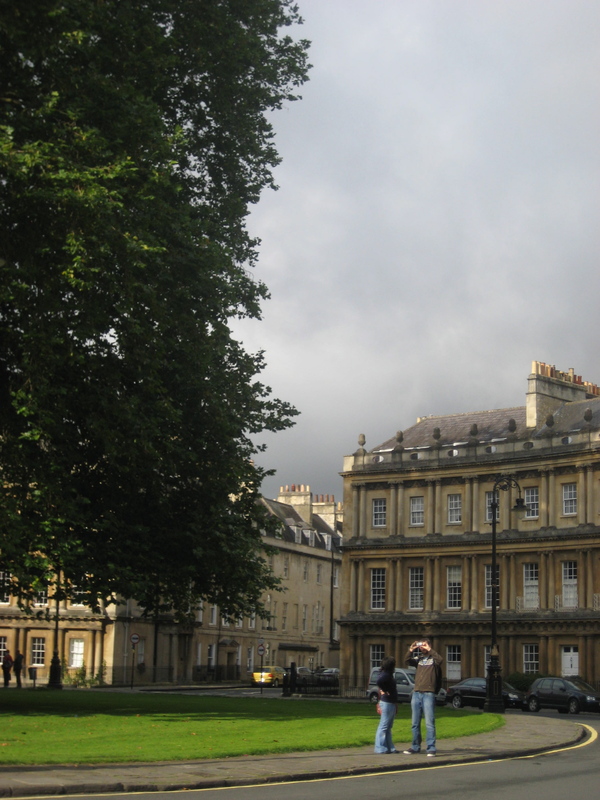 I am new to the city, and maybe should not express an opinion, but l have lived and worked in the region for nearly forty years and l did front an architectural series on Bath called Set in Stone. It was directed and produced by my good friend Howard Perks – now living down Plymouth way. I have decided to re-kindle an old fire that certainly raised emotional temperatures back in the 1960’s. It was the last time the City Fathers seriously considered taking an axe to the gigantic plane trees that express their vigorous natures freely in the midst of the Circus. I sat down to compose a ‘flyer’ – a general letter l could post through every one of the 33 front doors in this Grade One listed and iconic circle of ornately carved Bath stone. I explained l was exploring the idea of producing a Virtual Museum of Bath on-line and examining some heritage issues for possible inclusion in this new website. In my letter – and l repeat it now for those of you who might not know – l explained how John Wood the Elder did not live to see the Circus completed. He died in 1754 just months after the foundation stone was laid. Obviously, however, his son would have had very detailed plans to follow. I quoted from ‘Obsession:John Wood and the Creation of Georgian Bath’ – a book published by the Building of Bath Museum as part of an exhibition back in 2005 – ‘the Circus was envisaged as a structure where the only element of nature to be found was the sky above. It was a dramatic and theatrical space where the architecture took centre stage’. I wanted to know if residents would agree with me that the ‘architecture’ is now rather dwarfed by the five large plane trees planted – at the expense of the residents – who decided to create a railed central garden at the turn of the 19th century. 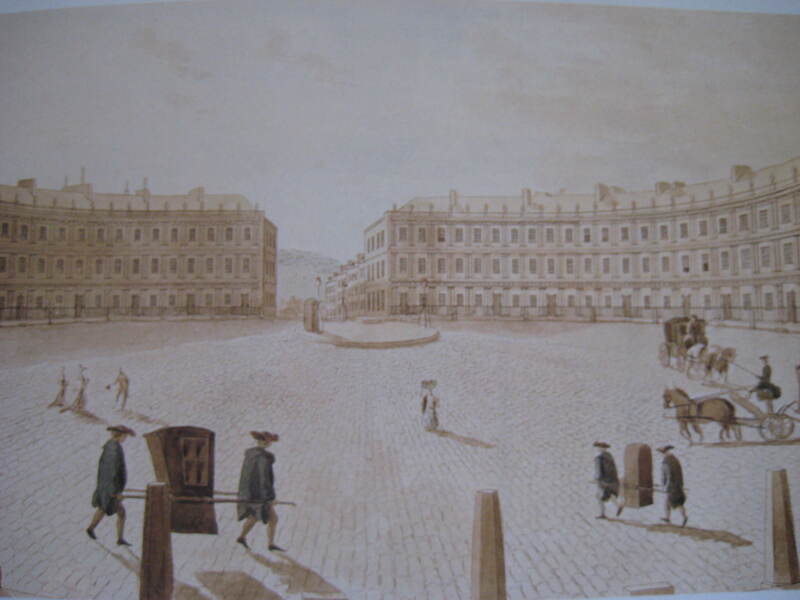 According to ‘The Hub of the Circus: A history of the streetscape of the Circus, Bath’ by Jean Manco, their age is estimated to be nearly 190 years – calculated on trunk diameter. She tells us that the residents were fed up with the clouds of dust thrown up by horses and carriages trundling across the limestone pitching laid within the bare centre. Their solution was to lay down a central garden with railings and shrubs. Many thought the garden would greatly improve their view! But while guidebooks in the 1830’s were referring to the Circus’s ‘charming shrubbery’, by 1847, one guide was describing the trees there as already interfering with the light. By 1856 a letter in the local newspaper was complaining about the ‘overpowering mass of dark foliage’. Nothing, it seems, is new. I was now testing the water once more. Asking, in my leaflet, if people thought the towering trees were robbing the surrounding architecture of its grandeur and also suffocating it with foliage. 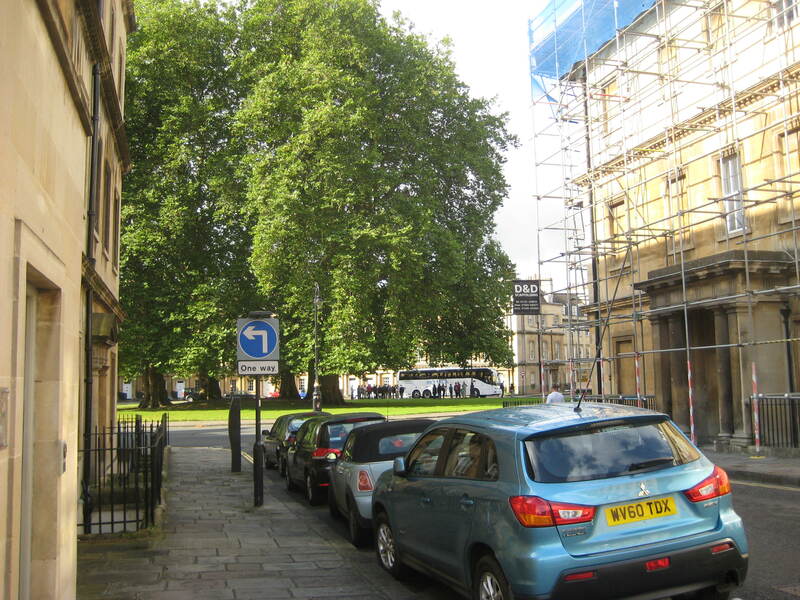 This was, l said, a hypothetical question but, given the choice, would the reader of my leaflet like to see the trees removed and the Circus restored to how its designer wanted it to look, or would he or she rather maintain the status quo and let the trees remain. John Wood had planned an equestrian statute of George 11 to go in the middle of his otherwise bare centre. The only other raised feature in this circular, cobbled sea was the raised water reservoir to serve the houses. I had not quite realised just how many people now live in the Circus and the fact that most individual terraced properties are subdivided many times over. However from 33 letters delivered l have received seven replies – by letter, telephone and email. Residents like Danielle Stevenson and Sheila Lamble agreed with me absolutely. Sheila would be ‘happy to see the trees go’ and Danielle wanted them replaced with a bronze statue of the man who designed the Circus but, ‘you would be lucky if the Council agrees to that’, she says. Meanwhile Tony Pease had more practical reasons for seeing the trees felled. ‘As well as spoiling the visual impact of the architecture, (they) also cause considerable problems with leaves blocking the internal valley gutters (necessary as there are no downpipes on the facades) in the autumn’. Also amongst those wanting the planes removed was Mrs Margaret Brown who has lived at the Circus, off and on, for many years. I asked her if felling the trees would rob residents of their privacy but she disagreed. ‘A friend rode around the Circus in one of those red tourist buses and reassured me that you could not see into windows’. Mrs Brown thinks the trees should go but warns such a decision might not be popular.’It would be fantastic to restore things to how they were but maybe only a really bad storm and tree damage would persuade the authorities to take the trees down’, she explained. Amazingly enough, during the three days and two nights of bombing Bath experienced in 1942, the one 500 lb device to explode within the Georgian arena only damaged railings around the central green. Those who favour the trees retention were passionate for longer in their vocal or written protest. Mrs Anna Harper rang to tell me she was sure the majority of people would want the trees to stay. She accepts they are a little big but argued they provided an additional and more natural attraction. ‘It is beautiful to see the sunlight filtered through the leaves. It adds an atmosphere. I would certainly miss the greenery’. Author Vivienne Rae-Ellis lives at Thomas Gainsborough’s old house in the Circus and wrote to tell me that the trees ‘provide living lungs for those of us who live here and for those who visit the Circus green’. Vivienne asked me to imagine the pollution from car exhausts without the trees to help absorb the fumes. ‘In any case the changing seasons give us plenty of opportunity to see John Wood’s architecture without the intrusion of leaves. For six months of the year the trunks form an artistic skeletal structure of their own, permitting inhabitants and visitors alike to enjoy the buildings unobscured. Nature does the job for you’! Declaring herself someone who is very interested in architecture and no fanatic tree protector, Susan Haberer still rallied to their defence in her email. ‘They make the Circus friendlier, less exposed and therefore a more protected place to live in than the originally intended layout which was mainly for show’. Susan says the trees bring in Nature and the ability, in the middle of a city, to observe the changing seasons and, with that, to observe the change of the view of the Circus buildings. ‘I think the green, especially, makes it feel welcoming, despite the grandeur of the architecture’, says Susanne, but she does agree ‘the trees in the Circus could be cut back a little if that’s possible’. Thank you to all those residents who contacted me. I have not canvassed opinion outside of the Circus but hope this article might lead to others having their say. Maybe a more radical pruning is the answer. Or cutting them down and replanting something that would not grown quite so big. According to author Jean Manco in her book ‘The Hub of the Circus’, in 1961 the Council’s Planning Committee considered sending for the axe man and was greeted with an explosion of protest – including a petition signed by 500 students from Bath technical College. In a compromise agreement some lower branches were lopped off to improve the view. More tree ‘surgery’ was necessary in 1990 through a fungal disease infecting the central tree of the three opposite Brock Street. However, despite a quite drastic thinning, the trees still dominate the Circus. But who is going to be brave enough to stand up and say something should be done? Maybe, like Mrs Harper suggested when she rang me, cobbling the existing circular carriageway would be a better and rather more useful drastic intervention. It would certainly slow the traffic though l think the rumbling noise it would create might be a bit tiresome. No pun intended! There is no such thing as one history nor one period of history. The Circus has continued to lay down layers of the stuff as an area where succeeding generations live and interact with each other and the surrounding city. Maybe the trees should be seen as the same sort of historical intervention as plate-glass in Georgian window panes?